Okay, so I'm reviewing the two books together because I kind of marathoned through them one right after the other. 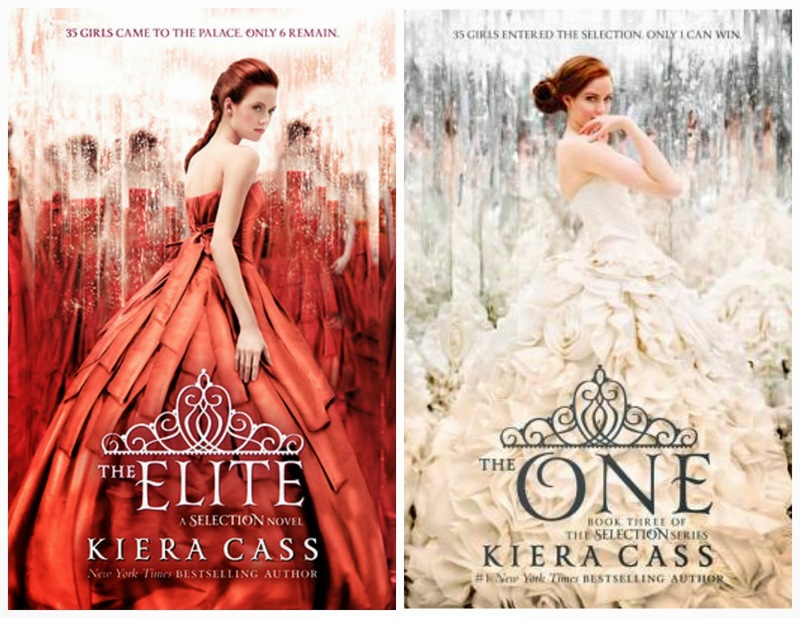 I said in my review for The Selection that the politics and history of Illea, the country where the story takes place, was more interesting than the Bachelor-esque story about Prince Maxon choosing his bride from 35 girls while the rest of the country looks on. Welp, still true. At the end of the first book, the field had been whittled down to 6. You'd think it'd have been over quickly after that, but it stretches on for two more books. And can we take a minute to talk about Elise, who is ostensibly the only PoC among the Elite girls (the final group) and possibly the entire cast of characters? She's Asian. And it's made quite clear that her value lies only in her political connections to New Asia - there's nothing desirable about her personally. She's also the stoic one, who suffers silently through some bullying that she experiences at the hands of one of the other girls and is always so cool and collected and exhibits no passionate emotion. And she also talks about honor and family quite a bit. Yeah, thanks, Kiera Cass. I totes felt represented there! The saving grace of this series is the sociopolitical troubles going on in Illea, and how America becomes a champion of the people, being the only one who understands what it's like to be lower-caste and poor. There is also the fact that she is given an original copy of founding father Gregory Illea's journal, and she realizes immediately that she's never read any written accounts of their history - the information has always been passed along orally - and she realizes the truth about the historical figure that her country has branded a hero. This stuff was interesting, and I'm glad it ended up becoming a bigger part of the plot. But then again, if you want some really good social commentary, you might as well read The Hunger Games trilogy itself than this one. I didn't hate the series as a whole, but I didn't love them either. I guess I would say that I liked them, but I didn't really feel entertained or inspired by them. I kept reading because I was curious to see how things would go, but I don't know if I really enjoyed the experience much. It's like binge-eating without really tasting the food you're putting in your mouth. The trilogy feels more soap opera-esque than anything - addicting in a superficial way and mainly fluffy. The love triangle that ends up not being much of a love triangle is uninteresting and tiresome, since YAF seems to thrive on love triangles ever since Twilight. I can't say whether I was Team Maxon or Team Aspen, and I didn't feel invested in her decision at all. I felt like there could've been a really good opportunity for political commentary here considering the fact that the protagonist is actually named America and the country they live in is rife with discontent and inequality. While her character arc does revolve around her discovering her capacity for leadership and compassion, it jumps through a lot of "I need to impress a man" hoops before she realizes her potential. Oh well. I'm not sorry I read it, but I doubt I'll be revisiting it anytime soon.